If it's not a newly rebuilt engine then the oil holes coming up from the camshaft may be plugged. If it's a newly rebuilt engine then the builder may have gotten the cam bearing in wrong. The upper slot in the oil filter adapter is where the non-filtered oil comes from in which to supply the oil filter. The center hole is the filtered oil from the filter and leads to the block oil galleys. The slot in the oil filter adapter being at the top is to minimize oil drain back when the engine is not running. You don’t say if this is a fresh engine build or one that has already been run for awhile. 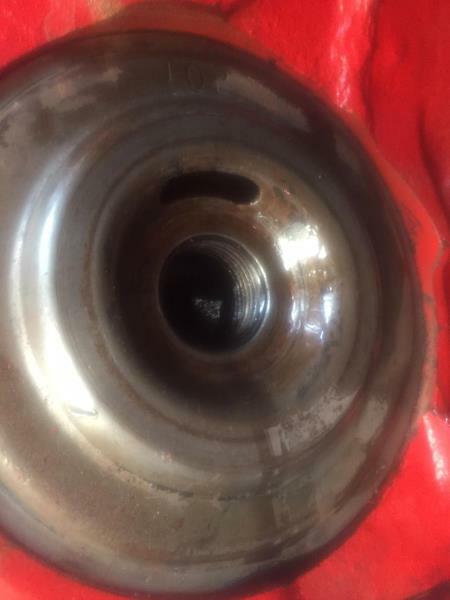 Assuming this is an engine with some run time, the most likely cause for the lack of oil to the top end of the engine is typically related to a soft cam bearing at the center or #3 cam hole. If this is a fresh engine build and has not been started yet but you are attempting to pre-lube it, then it would be helpful to know if the center cam journal is cross-drilled or grooved. As Paul brings up, the center cam bearing being clocked incorrectly is a common mistake by shops not familiar with the older engines. More detail is needed to give you a more exact answer.